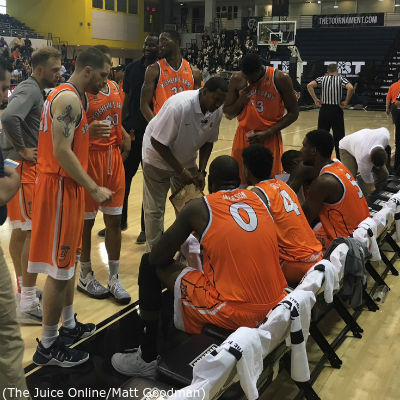 HomeBasketballWhat would be the best Boeheim’s Army team? What would the best SU alumni team? NEW YORK — I must be honest with you. I didn’t really pay too much attention to the first two years of The Basketball Tournament. After going to the game Thursday night at LIU’s Brooklyn Campus, I seriously regret that. The nostalgia, both for covering games (something I hadn’t done in person since 2005) and for Syracuse Basketball Alumni grabbed hold of all of my emotions, and, well, I enjoyed time traveling back to a simpler time. The game itself was a good one with 9 lead changes and 9 ties in a 65-61 win. Boeheim’s Army, composed of ex-Syracuse players from 2005 through 2017, shot poorly, and had a hard time keeping Team Fancy off the offensive boards, which helped keep the game close. Eric Devendorf led the Orange charge with 19 points on 7-17 shooting and made the key assist to Brandon Triche, who knocked down a corner 3 to seal the deal for the Army. On Sunday, Boeheim’s army advanced to the Championship semifinals with a dramatic come-from-behind 72-67 win, and the team was genuinely happy and celebrated after. James Southerland keyed that run, scoring 23 points in 23 minutes. It was fun to see those guys, who have mostly fallen out of the limelight, really take pride in their craft and their passion. Of course the $2 million dollar grand prize wouldn’t hurt either. 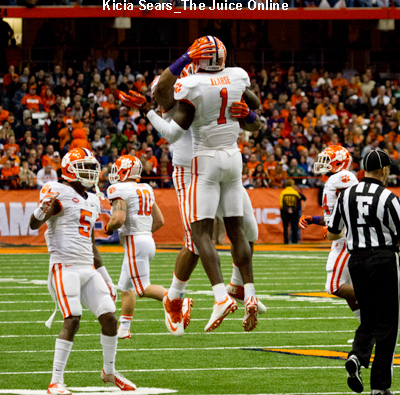 But as Triche and Donte Greene made clear after the game, playing in front of the mostly Syracuse crowd made it special. “It’s a great experience to play in front of your fans,” Triche said. “Especially when you can hear individual people” (referring to the small venue versus the dome). “Cuse fans are the best in the world,” Greene added. » Related: What should be expected from former Syracuse star Tyler Lydon’s rookie season? The love affair between Syracuse players and fans is nothing new. We see it and live it every year. But seeing it between players and fans that haven’t really been in each other’s lives for over 8 years in some cases made me think about who else I wished was there. Who would make the best starting five for a Syracuse TBT team. For this exercise, I am only going back to 2001, when I first arrived on Syracuse’s campus, since this is about players and fans connecting. I decided to look at how each player performed while under Coach Jim Boeheim’s tutelage, and all the big moments and memories they provided. While some players had more NBA success, I admit I was swayed by the personal connections in some cases. And this list assumed no one has aged since they last played for Boeheim. In other words, I wouldn’t necessarily chose these guys to play today, but if I could get them during their peak playing days, sign me up. In his four years at Syracuse Gerry hit countless clutch threes and free throws, played hard-nosed defense always, and even ran some point guard. But, if I was started a team for the TBT, he’s the guy I’d want as my leader. There have been a lot of great point guards during my fandom. Tyler Ennis, John Gillon, Billy Edelin, Brandon Triche, Michael Carter-Williams, and Scoop Jardine to name a few. But Jonny Flynn and the 6-OT game against UCONN holds a special place in my heart. 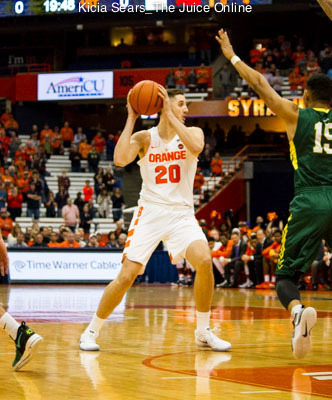 Also, in his two seasons at Cuse, Flynn averaged 16.6 points and 6 assists per game. More than any other point guard in both categories. Wait, I should give a special shout out to Wesley Johnson, Andrew White III, Donte Greene, Kris Joseph, Josh Pace, CJ Fair, and Demetris Nichols for their stellar play during their Orange tenures. But none of them are Carmelo, nor are they even close. PF– On second thought, let’s move Carmelo to the 4-spot, and revisit the small forward. That doesn’t mean I don’t appreciate the contributions of guys like Terrence Roberts, Tyler Lydon, Hakim Warrick, Jerami Grant, and Tyler Roberson Syracuse has had some great big guys. We need a center, and my pick will surprise you, but this is a good opportunity to add some more shooting and athleticism. Let’s not forget that Carmelo averaged 10 board per game during his one season on the hill. He’d be the perfect power forward for the TBT. SF- So back to the other forward. This is a very tough choice since the small forward has long been the strength of Jim Boeheim coached teams. I’m picking C.J. Fair here. He’s a glue guy who can do it all, and it gives Carmelo the ability to play outside if he wants. I know what you’re thinking, but there has never been a better shot blocker to wear the Orange uniform. With all the offensive firepower that Flynn, Gerry, Melo, and even CJ can provide, having a rim protector like McNeil would make this team unstoppable. Yes, Rakeem Christmas, Arinze Onuaku, and even Rick Jackson are more polished on both ends of the floor, but no one intimidated a driving wing or guard quite like McNeil did. Man, that was fun. I hope you enjoyed this trip down memory lane as much as I did.